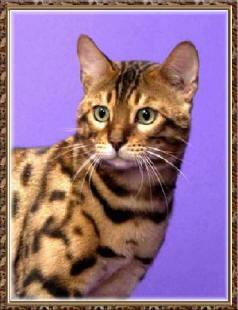 Bosquebengals Stud of Santa Fe Bengal or "Studman" has some very famous lineage. Studman's full, same litter, brother is CH Bosquebengals Concho and their father is the famous Calcatta Rollin da Dice... who's full, same litter, brother is the very famous RW SGC Calcatta's Custom Made. See Studman's Dam and Uncle as well as his immediate pedigree below. 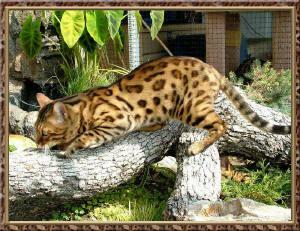 Dice is retired and happily living as a Pet Bengal. Unfortunately, there are no photos of Dice available. RW SGC Calcatta's Custom Made is Studman's Uncle. "Gus" is owned by Christina Dahleen of Calcatta Cattery. Thank you, Chris, for allowing us to use your photos! A full five generation pedigree for Studman is available.